The 2014 French SUP Racing Championships are happening this weekend, with a spot on Team France and a ticket to the 2015 ISA World SUP Championship up for grabs. 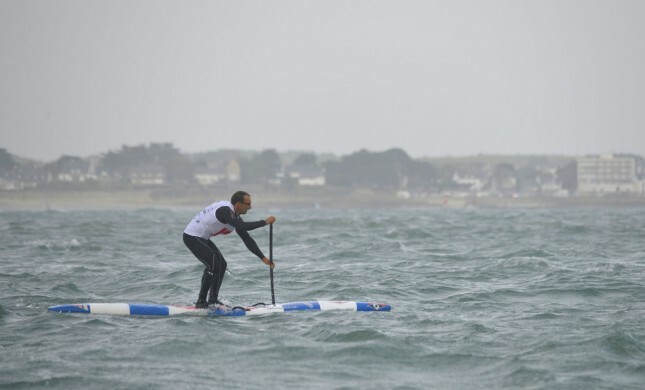 France’s National Titles – aka the ‘Championnats de France de SUP Race’ – are being hosted at Quiberon on the country’s west coast (Google Maps) and have attracted all the big names from the powerhouse nation of European SUP. The course race finished moments ago and once again it was Arthur Arutkin who dominated. That makes it a clean sweep of the event for the 17-year-old and pretty much guarantees he’ll have a spot on the French team in 2015 (I spoke too soon… see below). Once again Arthur not only won the race but dominated it. Arthur’s winning time yesterday was one and a half minutes faster than his nearest competitor, however today, despite the shorter course, he finished with an even bigger lead. Post by Fédération Française de Surf. After yesterday’s strong winds produced a “sidewinder” for the distance event, the conditions were once again tough for today’s course race. There were consistent 4-5ft waves, which created plenty of carnage around the course. Several of the competitors told me it reminded them of the Battle of the Paddle at Salt Creek last month. Arthur mastered the waves better than anyone, finishing exactly two minutes clear today and capping off a huge weekend. 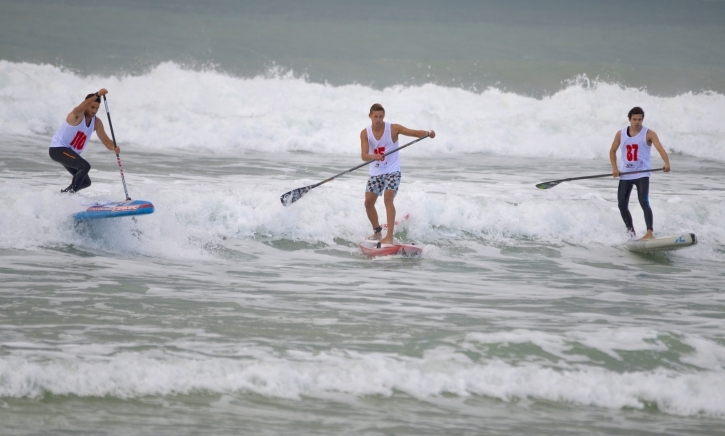 After some strong paddling early by Martin Letourneur and Titouan Puyo, Arthur paddled clear in the second half of the race. Behind Arthur, Titou once again finished runner-up, showing his all round talent and proving he’s a threat in any race. Titouan has come a long way as a surf racer in the past 18 months and was clearly stoked with his result today, which makes up for the frustration of having to do a “sidewinder” (instead of the potential downwinder) in the distance race yesterday. Martin Letourneur – one of France’s fast-rising juniors and a hero at the Battle of the Paddle last month – looked good all race and finished with an impressive third place today, highlighting just how bright France’s stand up paddling future is. There was also strong performances today from Yoann Cornelis (4th) and Greg Closier (5th), both of whom showed great consistency over the weekend. These guys also showed the “old guard” have still got it, along with guys like Gaetan Sene (who finished 4th yesterday but wasn’t as competitive today). Meanwhile in the women’s, it was the SUP surfing specialist Caroline Angibaud who used her skills in the waves to claim the win. Caroline has represented France in the SUP surfing portion of the ISA Worlds, however this weekend she showed her skills on a 12’6 instead. Yesterday’s distance race champion Celine Guesdon was relegated to third place, with Solange Pruvost finishing runner-up. The waves were very challenging: Eric Terrien, who finished in a very uncharacteristic 10th place today, said that “All the waves I didn’t eat at the BOP, I ate today!” while another top Frenchman, Vincent Verhoeven, had to retire mid-race following a bad crash that left him struggling to breathe. France has by far the strongest talent in Europe and would probably be the fourth strongest stand up paddling nation in the entire world (behind only Australia, Hawaii and USA, and perhaps tied with Tahiti…). But for all the great paddlers in the country, it was Arthur Arutkin who was the undisputed king of French SUP racing this weekend. Those who follow the sport closely have long known this kid has a special talent, however Arthur has never really shown it at this level. Now there is no doubt: This guy is a serious contender in the world of elite stand up paddling. Arthur’s joy soon turned to anger and frustration though: Despite winning both the distance and course race titles (actually he won 4x titles – he’s still only 17 years of age and therefore won both the junior and open championships in each race), the French Surfing Federation made the bewildering decision not to include Arthur in the French Team for next year’s ISA World Champs. Apparently the French Championships were only one part of the selection process, with results from the domestic and international racing season a contributing factor. That’s fair enough – some paddlers have one bad race and that shouldn’t cost them a spot if they’ve had a really good season. I was told by French Surfing Federation officials that because the ISA event is going to be held in March next year, there wasn’t enough time to do a second round of qualifying races (which France calls ‘Selection Week’ – something they did in 2013 a month after the National Titles). That itself is confusing: Firstly, why exactly do you need a second round of qualifying? And secondly, why is there “not enough time” when the ISA event is still four and a half months away? But things get even more strange… Because there was not enough time for this additional round of qualifying, the French Surfing Federation apparently chose the 2015 team *before* this weekend’s national titles. And they did so without informing any of the paddlers. So does that mean this entire French Championships event was held for absolutely no reason? The event is not going to help decide the team for 2015 (and I assume it’s not going to help decide the team for 2016 either), so what exactly was it for? The French Federation says that team selections are 1/3 based on the results of the French Championships, 1/3 based on the season results and 1/3 based on the special Selection Week. That’s fine. It’s a little vague (how do you weight each race during the season?) and probably a little bit of overkill, but there’s no major problem doing it this way. However if there isn’t enough time (even though there is) to hold the special Selection Week, wouldn’t it make sense to base selections 50% on the Championships and 50% on the season results? Instead, the French Federation have decided to simply ignore the French Championships and base selections 100% on the season results. So again, what exactly was the point of holding the French Championship event this weekend? So anyway, based on the results this year, it sounds like the French Federation have selected Titou and Eric to represent France I’m 2015, which is the same duo that represented their nation at the 2014 World Champs. These two are superstars and will do France proud next year. And I’m stoked I’ll get to see both of them at next year’s event. They also both thoroughly deserve the opportunity, no matter what the results of this weekend. Titou is the defending world champ in the distance race, meaning he was guaranteed a spot on Team France no matter. The New Caledonian has had a string of other top results this year – plus he finished runner-up to Arthur in both races this weekend, which further cemented his claim in my opinion. Meanwhile Eric was a member of Team France at the 2014 World Championship, where he won the 4th-place copper medal in the course race. Eric has also had a string of top results at the international level this season, including a top 10 finish at the BOP Elite Race, aka the Most Competitive Race Of All Time (this was the best result by a French paddler at the BOP). So yeah, I wouldn’t disagree with those two being selected. They both deserve it. But to say Arthur doesn’t deserve a spot after his incredibly dominant display this weekend is insane… He should be the first one selected. Why not just send all three guys to the 2015 World Championships? There is definitely room in the ISA rules to send three guys for the SUP racing, even though there is only two in each race. Actually you could send as many as four guys and have each of them compete just once, so sending three is hardly a stretch. This seems to be a little known option that not many teams utilise (actually I don’t think any teams used this option at the 2014 Worlds) but I’m quite certain it’s in the rules. Yes, it means the French Surfing Federation has to pay for one extra airfare, but if the Federation wants to be cheap and use that as an excuse then I’ll personally buy Arthur his plane ticket to the 2015 Worlds. So I think the French Surfing Federation should just send all three guys: Eric, Titou and Arthur. I say Arthur should compete in both the distance and course race at next year’s World Champs, seeing he’s now the national champion in both disciplines. Then you’d have Titou compete alongside Arthur in the distance event, seeing he’s the defending world champ in that race. After that you’d have Eric compete alongside Arthur in the course race, as Eric was a podium finisher in that race at the 2014 Worlds and France’s highest-placed finisher at the Battle of the Paddle (which is what the ISA Course Race is modeled on). That would be a fair compromise in my opinion. It would also make Team France very strong: Titou and Eric could focus on their respective races rather than tiring themselves out by racing twice in the space of 2 or 3 days. This solution is simple. It’s fair. And it ends the controversy before it has a chance to escalate. Plus it will make Team France more competitive and give them a better chance of securing one of the top placings in the overall team championship. Anyway this all just happened in the past few hours so I’m sure we will be hearing more in the coming days. Hopefully the French Surfing Federation sees how crazy their decision is and will be flexible to the idea of sending three guys. But unfortunately this drama overshadows the great performances this weekend, which is not right. No matter whether he gets a spot on Team France or not, we should remember this weekend for just how incredible Arthur Arutkin’s performance was. We also shouldn’t forget the spirited efforts from Titou and Martin in the course race and Titou and Eric in the distance event. Plus of course the new female champions of France: Celine Guesdon in the distance event and Caroline Angibaud in the course race. The Long Distance race (or “Longue Distance” in French) has just finished, with Arthur Arutkin putting on a dominant performance in the men’s and Celine Guesdon proving too strong in the women’s. The young gun absolutely crushed it, finishing one and a half minutes ahead of runner-up Titouan Puyo, who was the defending champ going into this weekend. The field was very close after that, with less than one and a half minutes separating Titou and the next four guys – Eric Terrien, Gaetan Sene, Yoann Cornelis and Greg Closier. Sounds like conditions were pretty tough: The wind was blowing hard and the paddlers had been optimistic of doing a downwind race, however the final course design didn’t line up with the wind. So in the end it was more of a “sidewinder” race, which clearly frustrated several competitors. But no matter what the conditions, today’s win was a huge performance from Arthur. Titou is not only the defending French champion in the distance event, he’s also the defending world champion after winning gold at the ISA event in Nicaragua. 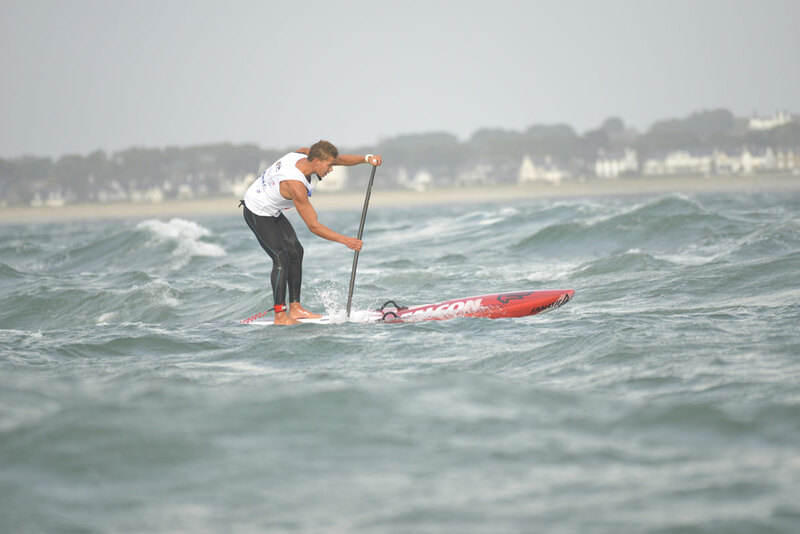 Meanwhile Eric Terrien is an absolute workhorse that’s been on the top tier of international SUP racing for years. Titou’s come back in the final stages of the race is worth noting: While he would have loved to have been going downwind the entire way, there was one stretch near the end of the course that provided some solid bumps. With 3kms to go, Titou was in 6th place, however this mini downwind section in the final 15 minutes saw him reel in everyone except Arthur. On the women’s side it was Celine Guesdon taking the win ahead of New Caledonia’s Miranda Barretteau. Olivia Piana, one of the likely contenders, had to miss the event due to injury, which left the door open for 2014 Team France representative Celine to stake her claim at another trip to the Worlds. The depth of talent in France is huge. They’re by far the most competitive nation in Europe and will be looking for a podium finish (top four) in the overall team championship next year. France’s team for the 2015 ISA World Stand Up Paddle and Paddleboard Championships isn’t decided just yet though, as we’ve still got the course race on Sunday. We’ll keep you posted with how it all goes tomorrow but in the meantime the FULL RESULTS from today’s distance event are below. There are also a bunch of cool pics right here and plenty more event coverage here and here.